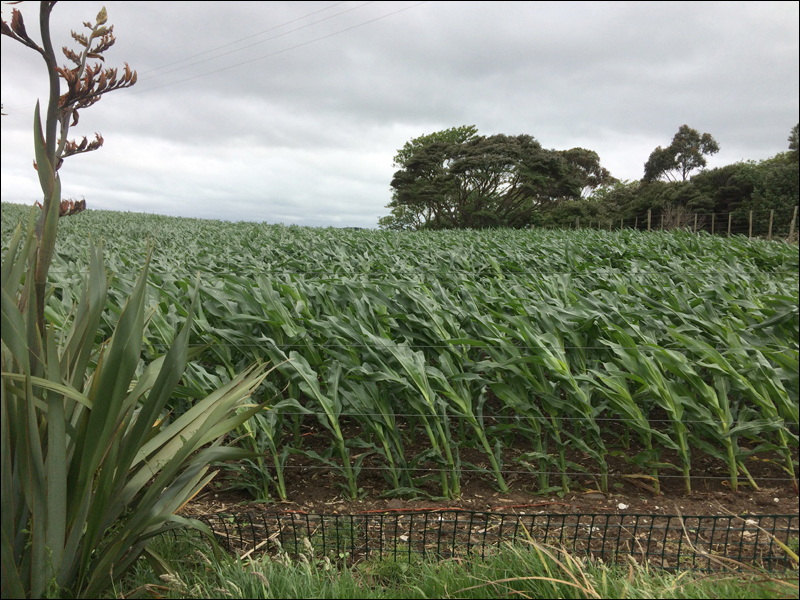 The south-easterly is howling through the maize in the field adjacent to our land. We were away from South Head from Saturday morning until Sunday early evening, and while we were gone, a very strong south-easterly wind developed. The prevailing wind for our area is supposed to be a southerly, but in actual fact, a straight southerly doesn’t really affect our property due to the fact that there is a convenient rise in the land that protects us. We do sometimes get a nor-easterly. While this is annoying, we’ve put things in place to protect our vulnerable plants – sturdy stakes and protective shelter material… that kind of thing. But this south-easterly is coming in from an angle we haven’t experienced before. The wind is doing its best to separate the washing from the line! 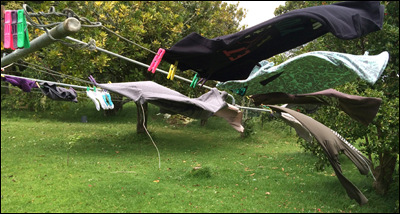 When I hung out the washing earlier I had to use twice as many pegs per garment. It reminded me of trying to wrestle with cloth nappies in Lyall Bay, Wellington, back in the 70s. 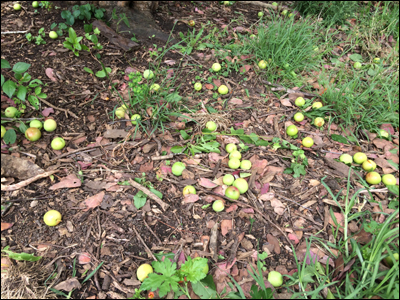 I was too exhausted last night to look at the garden, but the first intimation I had that all was not well was when Ben reported that nearly all the fruit had been blown off from my favourite plum tree. 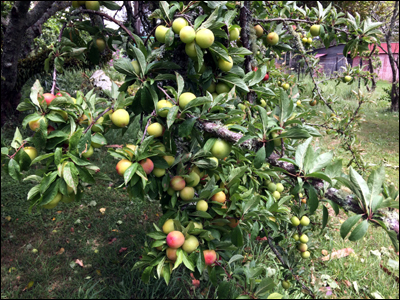 This is the plum tree in what we now term our ‘native’ area – it’s an old tree that has less plums than the one growing closer to the vege garden. But the plums are larger and have a deep red flesh. I love them and have been looking forward to eating them. When I went out earlier this morning to take stock, I felt like crying. And I do still have a heavy heart, but I suppose there is no point in shedding tears over lost fruit. At least we aren’t dependent on our fruit or our crops for our livelihood. Fortunately, the other plum tree is situated out of the worst of the wind. It’s still laden with fruit. The wind has has had an impact on the birds that have chosen to make their homes here, as well. I’m sure they were just as unprepared for the wind’s unusual direction. 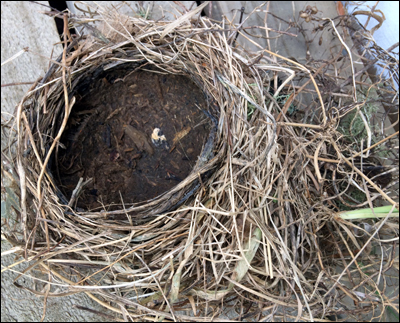 We’ve found quite a few parts of nests on the ground, and the sparrows are busy with recycling; flying down to collect the broken nest parts from the ground and carrying them back up to their respective nesting sites. A tiny nest lined with hair of some kind. 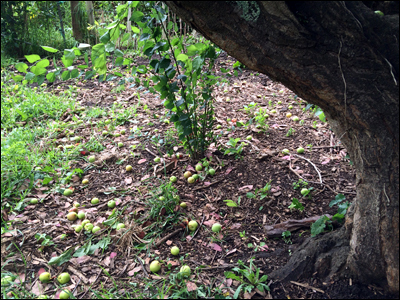 Ben found the above nest below the macadamia tree, although it’s so light that it could have blown from anywhere. It’s quite a bit smaller than any I’ve seen on the ground before. The diameter of the inner bowl is approximately 4.5 to 5 cm and it’s lined with silvery grey hair of some kind. I pulled a couple of strands out and it’s too coarse to be human or from a cat. And I think too long to be from a dog… I’m wondering if it’s horse hair or something like that. I really have no idea. 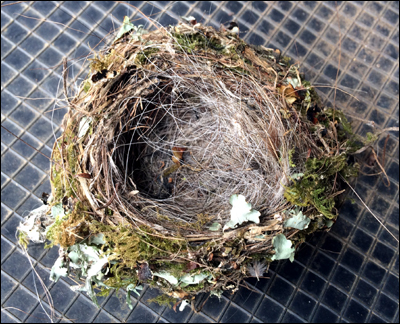 It’s a beautiful little nest, though, with moss and lichen woven in to the outside. Possibly a blackbird’s or a thrush’s nest. The above nest is much more loosely-woven than the smaller one. It’s also quite a bit larger – around 9 to 10 cm across the bowl of the nest. We’re pretty sure it belonged to either a blackbird or a song thrush. We could only see the tail of the bird sticking up when it was sitting on, it as it was just out of eye sight. The nest had been built in quite a small, spindly broad-leaf, and right from the start was partly tipping out, so it’s not surprising that it was dislodged by the wind. This nest is constructed almost entirely from grasses, with a tiny bit of lichen visible… and it seems to be lined with fine mud. 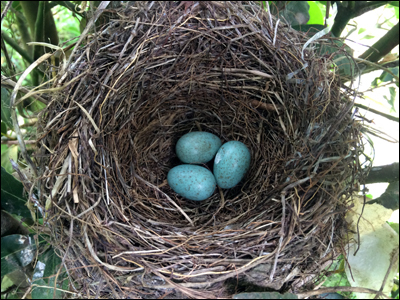 Our resident Blackbird couple are raising their third batch of eggs this season. The female is currently sitting on three eggs – I had first observed her back on the nest on 09 December, which surprised me. Raising young seemed to be a never-ending process for her and I wasn’t sure if was because something had happened to her previous babies or whether she would keep on raising new broods if time allowed. It seems amazing to me that it only took 13 days to go from hatching to flight. I found an excellent page which provided me with the answers on the Tiritiri Matangi site. It seems that Blackbirds do raise 2 – 3 broods per year, and that the chicks fledge at 13 – 15 days. The other interesting fact I read is that a Blackbird’s possible lifespan is 15 years. 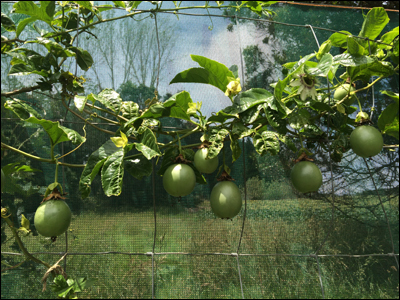 It’s going to be a bumper season for passion fruit. 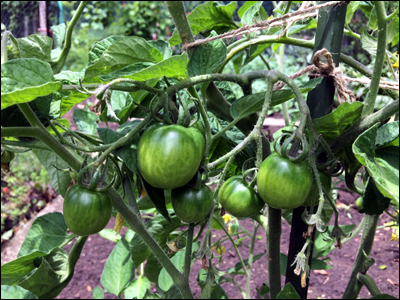 The tomatoes are coming along nicely. We’re been well-served by our vegetables and have been eating asparagus, beetroot, silver beet, green beans, peas, lettuces, rocket, new potatoes and Florence fennel. Probably some other things as well but it’s hard to keep up. My favourite early Summer flower. 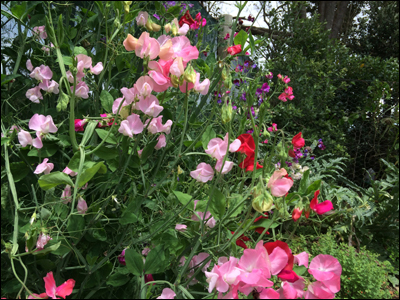 I can’t finish today’s entry without putting in a plug for Sweet Peas. I was very disappointed with the strike rate for the seeds I sowed in winter. I had used up a whole packet but only a handful of seeds germinated. Well… the ones that did sprout, combined with a few self-sown plants, have provided a wonderful display once again. I’m sure the extra rain has helped, too. I love these flowers and every other day have picked enough to fill two vases. Even as I sit here writing I can smell their sweet and spicy scent from across the room. So sad about the plums. I hate destructive wind too, it can wipe out precious things in an instant. Amazed to hear about the blackbird life span. We have a distinctive one here which makes us laugh with its quirky song. First heard it 3 years ago, then not at all last year and then this year he’s back! Hopefully he will keep returning.